CONFUSED BY HEARTWORM PREVENTION OPTIONS!? An overwhelming amount of heartworm prevention options are available for your dogs and cats. It is hard enough to remember the prevention – and twice as difficult to pick the best product for your pet and your lifestyle. Here are a few points to help you narrow down the various heartworm prevention options. 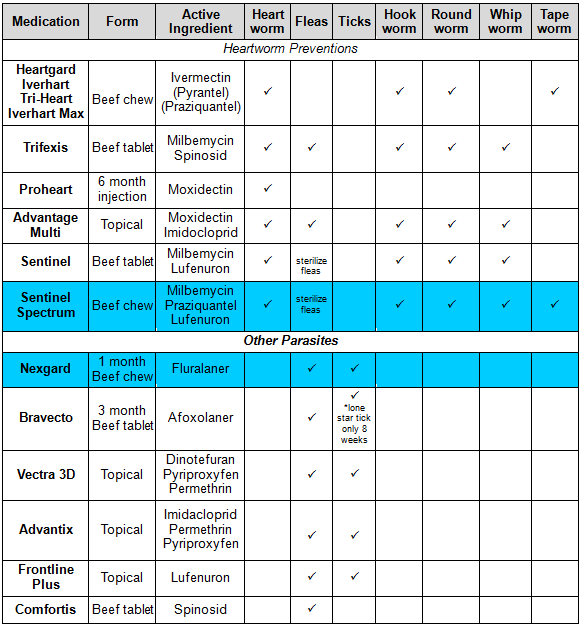 The Medication: Each heartworm prevention product on the market will prevent heartworm disease in your dog, but many also provide additional control of various parasites. Be sure that you are aware of the added benefits of each medication. Many products will also prevent other important diseases to which your dog or cat may be exposed. In general, you will find that the lower the price, the fewer added benefits. The Method: Each preventative also comes in a unique form such as flavored chews, tablets, or topical application. Pick the one that makes it easy to administer so that you (and your pet) don’t mind doing it every month! The Price: As you would expect, the products that perform best may cost more. Decide on your monthly budget for preventatives and talk to your veterinarian about the best choice for your pet family. The Provider: Find out which product the veterinarian you trust recommends and why. You will find that some products are available online for very low prices, but beware! These products usually are not guaranteed by the manufacturer unless purchased directly from a veterinarian. Sometimes expired or mishandled products fall into the hands of mass distributors or are falsely packaged and sold for a low price. For the dog in your life, CHV recommends a combination of two products that are treat-like and very easy to administer. These two products also provide the best comprehensive prevention for heartworm disease, fleas, ticks, whipworms, roundworms, hookworms, and tapeworms. Using Sentinel Spectrum and Nexgard together will supply the best combination for monthly prevention. CHV agrees that remembering to give the prevention is a huge challenge for many pet families. We recommend giving all of your medications on the first of every month and will send out alerts with emails and on social media to help remind you! If you still have concerns or questions about heartworm prevention and treatment, please contact Drs. Blackwood and Kahuda at CHV. In addition, many answers you need can be found on the American Heartworm Society website www.heartwormsociety.org. See the chart below to summarize the benefits of some of the major products on the market.